As a former drug addict, Greg Merson says his passion for poker saved his life. That same passion has empowered him to become the game's world champion. On Wednesday morning, Merson won the 2012 World Series of Poker Main Event at the Rio All-Suite Hotel & Casino in Las Vegas. The 24-year-old from Laurel, Md., bested a field of 6,598 to collect the top prize of $8,531,853 and the coveted WSOP Main Event bracelet. Merson won an epic marathon final table that lasted 398 hands, the longest ever at the World Series of Poker. Three-handed play alone lasted 197 hands and more than 11 hours. Merson defeated Jesse Sylvia heads-up to win the title. Sylvia, 26, took home $5,295,149 for his runner-up result. With the win, Merson became the first player since Chris Ferguson in 2000 to win a preliminary WSOP bracelet and the Main Event in the same year. 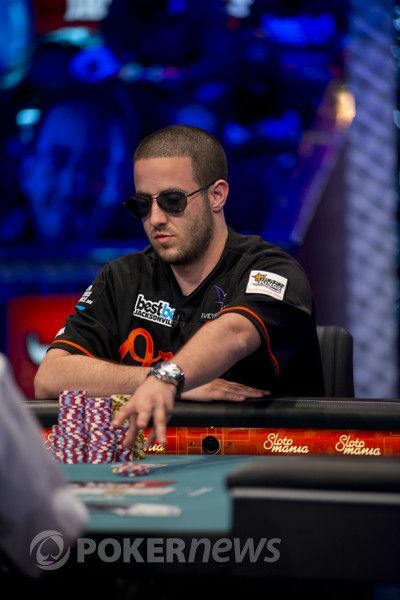 His two bracelets in 2012 also pushed him past Phil Hellmuth as the 2012 WSOP Player of the Year. Merson took control of the three-handed table right out of the gate, winning eight of the first nine pots. Then, in a hand against Balsiger, he became the first player to hit the 100 million chip mark. With the blinds at 300,000/600,000 and a 75,000 ante, Merson raised to 1.2 million from the button. Balsiger three-bet to 3.5 million from the big blind and Merson called to see a flop. Balsiger led out for 3 million, and Merson put in a raise to 7 million. Balsiger opted to let it ago after a short time in the tank, and Merson suddenly owned more than half of the 197,970,000 chips in play. Merson sat back and watched Balsiger and Sylvia battle moments later, and it was the 21-year-old Balsiger who was able to double his stack. On Hand #157 of the final table, Sylvia had the button and opened to 1.2 million. Jake Balsiger three-bet to 3.5 million from the small blind, Merson folded, and Sylvia four-bet to 7.2 million Balsiger moved all in for 28.3 million, and Sylvia quickly called. Balsiger's tournament life was at risk, but the board ran out a rather uneventful . Balsiger let out a huge sigh of relief as he raked in a pot worth around 57 million. Sylvia was left with just over 37 million. Sylvia managed to fight back, though, and recovered many of his chips from Balsiger on Hand #185. Balsiger min-raised to 1.6 million on the button and Sylvia defended his big blind. On a flop of , Sylvia checked and Balsiger fired 2 million. Sylvia thought for a minute before check-raising to 5.6 million. Balsiger tank-called. The turn was the and Sylvia checked again. Balsiger bet 6 million and Sylvia called. The fell on the river and this time, Sylvia led out for 10.2 million. Balsiger sat motionless for a minute before opting to fold, and Sylvia climbed to around 68 million in chips, while Balsiger slid back to around 51 million. Balsiger lost another key pot on hand #216. This time, Merson limped the button and Sylvia called from the small blind. Balsiger raised to 3.7 million from the big blind, and action made its way back to Merson. He called, and Sylvia folded. On the , Balsiger bet 4.5 million and Merson called. The hit the turn and Balsiger fired 7.5 million. Merson called again, and there was 32.5 million in the pot. The river brought the and Balsiger took his time before betting 13 million. Merson responded by moving all in, having Balsiger's remaining 41 million chips covered, and Balsiger folded immediately. Merson flipped over for a well-timed bluff, and shouts of "POY, POY" rang from his rail. Merson couldn't hold back a grin as his stack climbed to 110.2 million. Things slowed down a bit until the 252nd and 253rd hands. It was during that 15-minute stretch that the game completely changed. First, Balsiger moved all in for 18,1750,000 from the button with and Sylvia called from the big blind with . Sylvia was five cards away from securing a heads-up duel with Merson, and those chances improved when the dealer rolled out a flop. However, the smacked on the turn to give Balsiger the lead, and the on the river gave Balsiger his much-needed double. On the next hand, Sylvia had the button and raised to two million. Merson three-bet to 4.8 million from the big blind, and Sylvia responded with a four-bet to 10.2 million. Merson decided to move all in, and Sylvia called immediately for his remaining 42.3 million. Once again, it looked as if a heads-up match was imminent as Merson's pair was way out in front. The flop gave Sylvia some hope with a wheel draw, and his huge rail of supporters began calling for an ace or a four. The on the turn left him one card away from a third-place finish, but the gave him the wheel and a pot worth 85,000,000. Merson stared at the board, stunned by the developments, as Sylvia was the chip leader for the first time since Monday evening. Merson rebounded nicely in a hand against Sylvia that pushed him back above the 100 million mark. Sylvia then took another hit against Balsiger that dragged the seemingly endless three-handed play on event further. Sylvia raised to 2.4 million from the button and Balsiger three-bet shoved for around 17 million. Sylvia asked for a count, crunched the numbers in his head, and made the call. The rails of both players erupted before the dealer rolled out a flop, giving Balsiger the lead. Sylvia needed an ace or running cards to finally put the 21-year-old away, but the on the turn sealed the deal, doubling Balsiger to 35.4 million. Sylvia was left with 56.6 million — and the trio marched on. The three players traded the chip lead numerous times over the next hundred hands. First, Balsiger doubled through Sylvia with against on a flop. That gave Balsiger 92 million chips and the lead, but Sylvia exacted revenge less than 10 minutes later. Balsiger limped from the button and Sylvia checked his option in the big blind. The flop came down and Sylvia checked to Balsiger, who bet 2.2 million. Sylvia check-raised to 7.6 million, which prompted Balsiger to move all in. Sylvia called and tabled for a flopped two pair, which was out in front of Balsiger's for top pair. The turn gave Sylvia a full house, which held up through the river to secure his double. 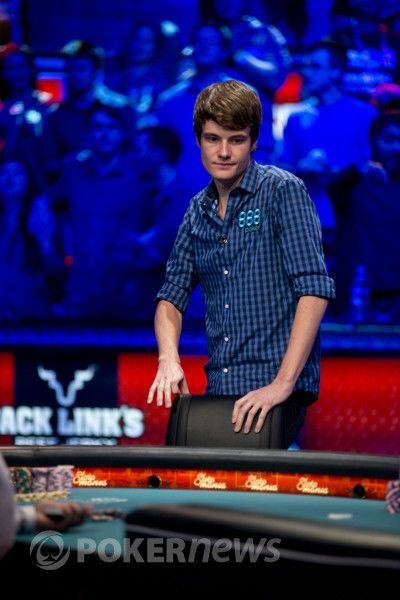 As the blinds increased, Balsiger found himself short, and on Hand #382 his dream of becoming the youngest WSOP Main Event champion ever came to an end. After Sylvia raised to 4 million on the button, Balsiger moved all-in for 20.3 million from the small blind. Merson asked for a count before calling from the big blind, and Sylvia got out of the way. Merson showed , which dominated the of Balsiger. The got a rise out of the crowd and it gave Balsiger some chop outs. The on the turn brought no help, and the on the river finally ended the tournament for one of the final three players. For his third place finish, Balsiger collected $3,799,073 along with many memories he will carry with him the rest of his life. That left only Merson (117.6 million) and Sylvia (80.6 million) playing for World Series of Poker glory. Merson leaned on Sylvia during the first 16 hands of heads up play by winning several small pots, increasing his stack to around 130 million. And on hand #398 of the final table, it finally came to an end. Merson min-raised to 4 million on the button, Sylvia three-bet to 9.5 million and Merson moved all in, having Sylvia's remaining stack of 69.3 million covered. Sylvia was left with a tough decision, swerving back and forth in his chair while riffling a stack of chips with his left hand. "Wow," Sylvia said to himself. He examined the pot, then stared down Merson, who sat motionless in his seat. Finally, Sylvia called, and the hands were revealed. Merson was out in front, but Sylvia had plenty of ways to win the massive 139.2 million-chip pot and reclaim the lead. The flop came out , which provided no help to Sylvia. The turn — the . Merson was one card away from victory. Everyone in the Penn & Teller Theater held their breath as the river brought the , and Greg Merson was offically crowned the 2012 World Series of Poker Main Event champion. Merson's incredible story is one of perseverance and determination. Earlier this year, Merson was recovering from a drug relapse that occurred after his career was stripped away from him on Black Friday. Months later, after refocusing his efforts on poker, he won his first bracelet in WSOP Event #57, the $10,000 six-handed no-limit hold'em event for $1.1 million. Now nearly 11 months clean, Merson has joined the likes of Doyle Brunson, Johnny Chan, Stu Ungar, and Hellmuth himself in the elite class of World Series of Poker Main Event champions.